Today we hear from a blogger many of you will know, Lucas of Chemist in the Bottle. 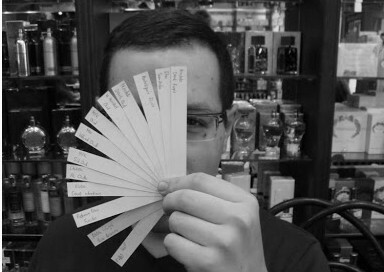 Lucas lives in Poland and writes from his unique perspective as a perfume lover and cosmetic chemistry student. a sunny view outside the window as I fold the blinds. a couple of things, like my wallet, a pack of tissues, house keys and a phone – all in my bag (although I often take just wallet and keys with me when I’m leaving for just a few minutes). when I know I did my best to overcome a challenge. I feel even better when the results of my work can be seen. taking an imaginary journey to the land of dreams where everything is possible. a pair of jeans or chinos, preferably in a black color. Perfume-wise: a bottle of perfume (haven’t decided on particular one yet) for my birthday in late February. Tatra Mountains and Zakopane, where I spent my childhood summer vacations for 7 years in a row, hiking with my parents. I like to call it a casual elegance. I love jeans and I pair it with shirts, polo shirts, monochromatic sweaters or elegant jackets. I just add a pair of brogues (or warm leather boots in the winter) and I’m done. is Prada Amber Pour Homme, the first fragrance I bought with my very own money. Ever since it’s been on the top of my list. Even though it’s not my only perfume anymore (yes, there were days when I only had this Prada) the perfume has a special place on the shelf and in my heart. My most beloved perfumery note is iris. take a lot of pictures. I really enjoy taking snapshots with my pocket camera – they allow me to capture the place and the moment of life. Months later I like to come back to them and remember the fun I had here and there. I also travel light, packing only the necessary things. my bed, a couple of smooth jazz CDs and a couple of candles as the only light in the room. I drink a lot of hot tea, don’t talk too much and prefer to be alone at that time. things that are practical or can teach you something. I always try to avoid gifts that would be of no use to the recipient. is a chance to put a smile on a face of my friend. If a friend is happy then I’m happy too! Also, I’d never want to miss the opportunity to achieve my goals. forgetting that since 1 January 2014 all trams in Poznań returned to their regular routes after the major railroad repairs. I took a wrong tram and in result I missed the train back home. Luckily the next one was just 1 hour later. some natural yogurt. When I get hungry I mix it with muesli and dried fruits to make a colorful and healthy snack. a glass of water, nothing else. I’m one of these who fall asleep within 5 minutes after they hide under the quilt. a family breakfast. As a student I live with my parents (the realities here are different than in the USA). Mum works in our hometown but Dad and I we both commute to work/university. Weekend is the only time during a week when we’re all home together in the morning. I don’t have a role model, in fact I never had one. I just try to live my life wisely and with some plan in my mind. Step by step I’m trying to make it work and helping my wish to come true. Maybe one day I’ll be a role model for somebody else? In the time since Lucas started blogging, he has made an amazing journey. His English has improved incredibly and I really respect and admire him for that. It will be interesting to see where life will take Lucas and whether his dream to become a perfumer will come true one day. I for one, am sure it will. This entry was posted in Interview and tagged Blogging, Interview. Bookmark the permalink. Lovely interview Birgit. Lucasz is almost exactly as I picture his mind in his answers. Very interesting guy. Thanks for the insights, both of you. Glad you enjoyed the interview, Portia! Oh, great, chemist in the bottle is one of my favorite fragrance blogs, thanks for featuring Lucas here! I admire his purposefulness and yes, black cats are supposed to be hugged!! I’m all on board too when it comes to hugging cats, black or otherwise! Thank you for participating, Lucas! I saw the lovely photo of you two on APJ! Good to see Lucas highlighted on here. He’s come a long way from that one bottle of Prada. Enjoyed learning more about Lucas. So unusual for your first perfume love to still be at the top of your list after falling down the rabbit hole. I like that a perfect weekend starts with a family breakfast and the fact that he is happy when his friends are happy. I wish him all the best in his studies and I also have no doubt he will achieve his goal. That’s right, it is really unusual that the very first bottle stays on top of the favorites lists. Thank you for highlighting Lucasz and his blog. He is fantastic and unusual among bloggers since he is a chemist, too, and he can speak to how notes are combined, etc. And he’s a great writer. His English is fantastic, much better than a lot of native English speakers, I might add. I speak only for Americans, who butcher the King’s English every day. Great interview, too. I love the questions that you ask. Thanks, Birgit! Thank you! I enjoy reading Lucas’s blog. It’s fun getting to know more about him. Glad you enjoyed this, Suzy Q. B., thank you for the interview – I learned something new about my perfume-almost-twin. The Chemist in The Bottle – now also in The Fridge and on The Nightstand! Would be interested to know what smooth jazz artists you like…? It’s nice to see Lucas here. It is like seeing a favorite actor as a guest star in another favorite show. Iris lovers unite!